The stand between England slow left-armer Dawson and Barker accounted for more than half of the home side’s runs, with only one other player – James Vince (11) – reaching double figures. Yorkshire’s success was built on an imposing first-innings 554-7 declared, thanks in part to Gary Ballance’s 148. It was Ballance’s second century in as many County Championship matches, while England captain Joe Root continued his own good form with 94. 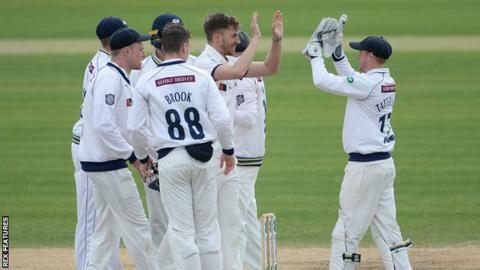 Dawson, who struck a half-century in his side’s opening win over Essex, hit 10 fours during his 167-ball knock, before falling just short of his ninth first-class century.